A new module named NSQ has been imported in Kamailio’s GIT repository, authored by Emmanuel Schmidbauer from Weave Communications. Emmanuel has become also a registered developed in order to maintain the module. In short, the module provides a NSQ connector for Kamailio configuration file, allowing to interact with NSQ servers from kamailio.cfg. NSQ is a real time distributed messaging platform, you can read about NSQ at nsq.io. The module will be part of the future major release Kamailio v5.0.0! While waiting for that release you can play with NSQ using the git master branch. Thank you for flying Kamailio! 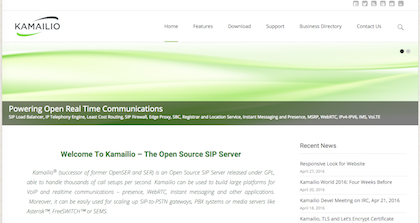 The kamailio.org website has been updated to use a responsive theme. The old skin was built during 2010-2011, the corresponding wordpress theme was not updated for few years, lacking the responsive layout. The new look keeps the same clean and clear approach. One of the major changes was the need to widget-ize the sidebar on the right, which used to be the main navigation menu for most of the resources provided by Kamailio project. Several of them were left on the new right sidebar and the rest along with new resources were indexed by the menus at the bottom of the pages. The main page for kamailio.org is planned to be reorganized with a fresh design in the near future as well, building on top of the framework provided by the new wordpress template. Suggestions on how to organize the website and its menus for better accessibility or more suggestive navigation are very welcome! Email us to . Time is passing and Kamailio World Conference 2016 is approaching at fast pace – only four weeks left till the start of the event! The schedule is pretty much nailed down, with some adjustments still expected to happen. The event starts like the past edition with a half a day of technical workshops, followed by two full conference days. A larger group of speakers is participating to this edition. There was a big number of speaking proposals and we wanted to highlight more of the people that had a relevant contribution to the evolution of the project. To accommodate properly, two more discussion panels were added, keeping also the classic VUC panel. The topics cover many of the interesting aspects of real time communications, from security and scalability to WebRTC and VoLTE, touching Kamailio and other open source projects like Asterisk or FreeSwitch. Don’t forget that this year Kamailio celebrates 15 years of development, the party is at Kamailio World! We expect to fill the capacity of the conference room, if you haven’t registered yet and plan to attend, do it as soon as possible to secure your seat! Many thanks to our sponsors that made possible this event: FhG Fokus, Asipto, Sipwise, Matrix.org, Sipgate, Simwood, NG Voice, Digium, VoiceTel, Evariste Systems, Core Network Dynamics, Pascom, Didx.net. Thank you for flying Kamailio and looking forward to meeting many of you at Kamailio World 2016! The next Kamailio Devel Meeting on IRC has been planned for Thursday, April 21, 2016, at 14:00UTC (10:00 New York, 15:00 London, 16:00 Berlin), on #kamailio channel from freenode.net. As usual, it will be a chat session between all Kamailio community members, developers and users, to discuss the plans to next major releases and various admin bits related to the project. This time we are talking about Kamailio 5.0, which aims to bring some significant features, including the ability to write all the routing logic in a well known scripting language (e.g., Lua, Python), with the option to reload it without a restart and, of course, offering a larger set of statements, libraries and tools around it. The old config file will stay in place as well. Among announced participants: Alex Balashov, Daniel-Constantin Mierla, Fred Posner, Olle E. Johansson, Victor Seva. If have something to discuss, do not hesitate to add your topics and list your name in the page. Anyone can participate, even only for watching the discussions. Let’s Encrypt is a free certificate authority launched in the second part of 2015, recently leaving the beta stage – from September 2015 to April 2016, they issued over 1.7 millions certificates. Started by Mozilla and backed up by big IT players and organization (e.g., Internet Society, Cisco, HP, Microsoft, Facebook, …), it offers free TLS certificates that are trusted by all the major operating systems and browsers out there. In other words, you don’t have to pay for a TLS certificate, meaning that it is no reason to support HTTPS for your web server and SIP over TLS for your VoIP service. Kamailio has one of the best and scalable TLS implementations, with asynchronous support since 2008, already deployed by large IM mobile services servicing millions of active users. If you don’t have TLS enabled in your Kamailio, it’s time to act, it costs nothing now and brings full privacy to your customers connecting over the public internet! Of course, kamailio.org website is already using a Let’s Encrypt certificate. Thank you for flying Kamailio! And looking forward to meet some of you at Kamailio World Conference 2016! It’s been a while since last session about Kamailio during the weekly VoIP Users Conference moderated by Randy Resnick. Next Friday, on April 8, 2016, join the VUC session starting at 12:00 EDT (17:00 in London, 18:00 in Berlin, Madrid Paris, Rome) to get updates about the new features introduced by the latest major releases of Kamailio, what are the plans for future development and get a preview of what’s going to happen at Kamailio World Conference (May 18-20, 2016, in Berlin). Daniel-Constantin Mierla, co-founder of Kamailio project, will be there to give the updates and answer the questions from the audience. Book the date in your calendar and join the session next Friday!